The FBI had one demand when they secretly teamed up Special Agent Kate O’Hare with charming con man Nicolas Fox—bring down the world’s most-wanted and untouchable felons. This time it’s the brutal leader of a global drug-smuggling empire. The FBI doesn’t know what their target looks like, where he is, or how to find him, but Nick Fox has a few tricks up his sleeve to roust this particular Knipschildt chocolate–loving drug lord. From the streets of Nashville to the back alleys of Lisbon, from the rooftops of Istanbul to the middle of the Thames, Nick and Kate chase their mark. When they find themselves pitted against a psychopathic bodyguard and a Portuguese enforcer who gets advice from a pickled head, they decide it’s time to enlist some special talent—talent like a machete-wielding Somali pirate, a self-absorbed actor, an Oscar-winning special effects artist, and Kate’s father Jake, a retired Special Forces operative. Together they could help make this Fox and O’Hare’s biggest win yet . . . if they survive. The Job shows readers once again that Janet Evanovich and Lee Goldberg still have it. Readers are swept up in not only an adventure across the globe but also in the increasingly interesting relationship between Nick and Kate. The stakes are big, the danger is high, and as always the laughs abound in this latest installment of the Fox and O'Hare series. This time the story starts out in the middle of a bust interrupted by a call from Nick to Kate, "I didn't do it." With that the pair sets off on an adventure across the globe after a brutal drug lord. As always Nick and Kate are great together, working well with each others strengths and weaknesses. In this book Kate has really began to gain some confidence in working with Nick and pulling off heists. I felt like this story was more about her than anyone with Nick taking a little bit of a backseat through the story. That's not to say Nick wasn't terrific, he was. He showed a slightly different side of himself in this story after running into an old friend and then again when he and Kate were split up in an unavoidable situation. I really would have liked to have seen a little more of this side of Nick in this book, but I'm sure as the series progresses we'll get to see more of it. The story and heist were delightful and I was never short of laughs while reading. I found it a little grittier than the previous books in this series which threw me a few times but didn't ruin my overall enjoyment of the book. Instead of the somewhat rocky pace of the last book we are treated to wonderful pacing in the Job, with excitement and mystery from start to finish. The heist was pulled off brilliantly and I enjoyed getting to see further into the point of view of the mark in this book. I was pleased to see some old favorite characters return in The Job. Growing steadily as one of my favorite characters is Kate's father, Jake. I really enjoyed seeing him interact with Nick. Their relationship should a rocky one, but the two get along remarkably well, and even take time to pick on Kate a little bit. Boyd and Willy return along with Tom Underhill. As with the other books we're introduced to a few new colorful characters and they all get their chance to really shine in this book. The Job is a wonderful read from start to finish, returning to the excitement and laughs that hooked so many readers in the first book. 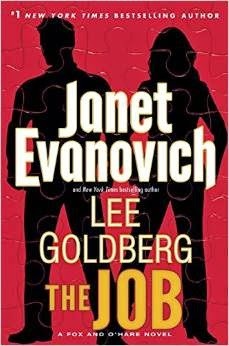 I am convinced that this series will only get better and better in the capable hands of Evanovich and Goldberg. The Job is a book not to miss. Note: I received an electronic copy of this book from Negalley for my fair and honest review which I have stated above.